Just like picking fruit and making preserves, gathering mushrooms and marinating them is a Russian classic. The weekend pastime harkens back to a time when communist citizens were free from the dictatorship of consumerism and social networks, and Muscovites could enjoy the simple comforts of their suburban datchas without spending hours in traffic jams and taking out half a dozen bank loans. 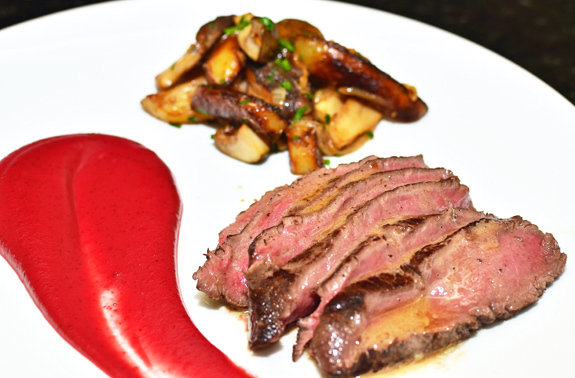 This recipe is loosely adapted from Anya von Bremzen’s Please to the Table. I like my marinated mushrooms with a relatively low level of acidity so I can still taste the mushrooms. The downside is that the brine probably isn’t suited for long-term preservation, so be sure to eat them all within a few days. 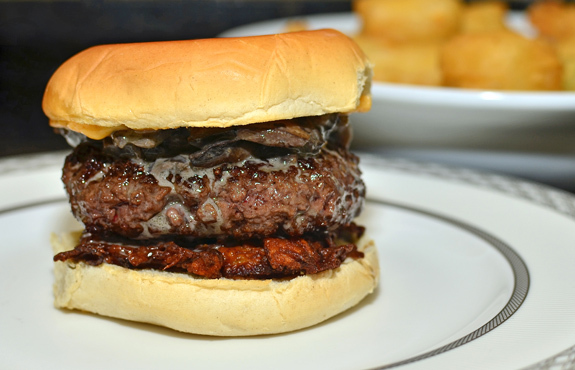 Regular readers of this blog won’t be surprised to see me using wild mushrooms. Porcini work great, and can be coupled with other spring vegetables. Chanterelles are equally suitable, and it seems that they’re available year-round nowadays, most likely as imports from all corners of the world. Place the water, sugar, salt, and lemon juice in a saucepan. Add the mushrooms and garlic, stir, cover with a lid, and cook over low heat for 8 minutes. Pass through a chinois. Measure 215 g of the liquid (discarding the rest), and add the vinegar. In a sterilized pint jar, alternate the mushrooms, garlic, bay leaf, dill, thyme, caraway and peppercorn. Fill the jar with the liquid, seal, and refrigerate. The mushrooms can be kept in the fridge for a few days. Marina Polvay really has a fertile imagination. The woman who (kind of) brought us the Veal Dubrovnik strikes again with the Fish Vojvodina. The recipe supposedly originates from the northernmost province of Serbia and consists of freshwater fish, such as pike or perch, layered with mushrooms and cream, then baked. Needless to say, nobody seems to have heard of it, and we’re here to change this. Next time you go to Belgrade, or just to Chow.com, don’t forget to spread the word! 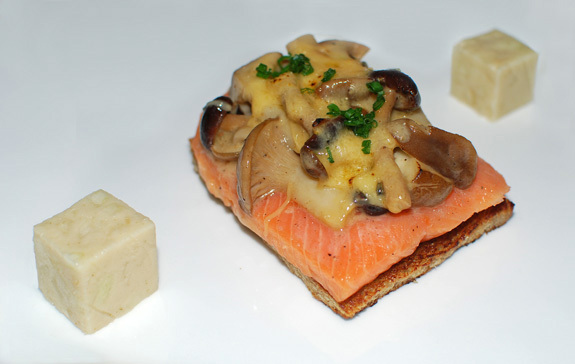 I wanted to keep the idea of layers but make the dish more interesting, and rye bread tastes delicious with the fish. Arctic char is closely related to trout, a much more likely inhabitant of the Vojvodina rivers. For the mushrooms, I use a delicate blend of trumpet royales and various clamshells sold at D’Artagnan and Whole Foods. Hard cider and melted aged gouda bring a pleasantly fruity note. This is a rather quick recipe. Except for the apple terrine that should be prepared ahead of time, everything can done while the fish is cooking — if you’re a little bit organized. Slice 3/5 of the apples. Heat the butter in pan until it turns brown (not black! ), add the apples and cook over medium heat until soft, stirring regularly. Add the chives and hard cider, bring to a boil and remove from heat. Let cool for 5 minutes. Transfer the cooked mixture to a blender, add the gelatin, then process until smooth and transfer to a bowl. Chop the remaining apples into a brunoise and mix into the purée. Pour into a 2″ x 4″ container (or something about that size) lined with plastic wrap, cover with more plastic wrap, and refrigerate for at least 8 hours. Quarter the trumpet royales lengthwise, and trim the stems of the clamshells. Season with salt and pepper, and sauté in a hot saucepan with butter over medium heat until golden brown. Add the hard cider, and simmer until reduced by 1/2. Add the heavy cream, and cook until the sauce is very thick and coats the mushrooms. Reserve. Season the fish with salt and pepper, cover both sides with the butter, and place in a sous-vide pouch. Cook in a 113 F water bath for 20 minutes, then start assembling the dish immediately. Trim the bread slices to match the size of the fish portions. Toast in a pan with the butter over medium heat. Reheat the mushrooms in a saucepan. Take the fish out of the sous-vide pouch. 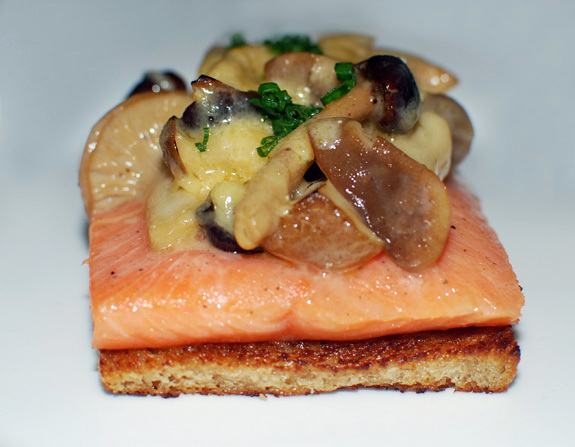 Place the arctic char portions on top of the toasts, then cover with mushrooms. Sprinkle the gouda, and melt using a blow torch — keep the flame at a reasonable distance, or the cheese will burn. Sprinkle with chives, and serve with the green apple terrine immediately.